I was a fig virgin a year ago….a fresh fig virgin. Mr Newton destroyed figs in my opinion. Those weird “cookies” were the only sweets in my house when I was young and I stayed waaaaaaaay away from them. Looking back, I guess that was a good thing. So maybe I should thank Mr Newton and my mom. Only having access to those piss poor “cookies” curbed my sweet tooth, that’s for sure. Late last summer, I noticed fresh figs at the store. They popped up like a secret and without any warning. My curiosity got the best of me and I brought home a small basket of fresh figs, unsure what to expect. Cutting into that dark flesh revealed such a surprise. The lush pink center of a fresh cut fig is so beautiful. I ate the whole basket in one day. I went back…bought more and brought them to anyone and everyone I could. I was a fig prophet. I wanted to yell from the rooftops and spread the word. “Behold…the FIG. It will save your life.” I couldn’t believe that I had been blind to this fruit in its raw form for 30 years. Although dried figs are available in stores year round, fresh figs are available in late summer. 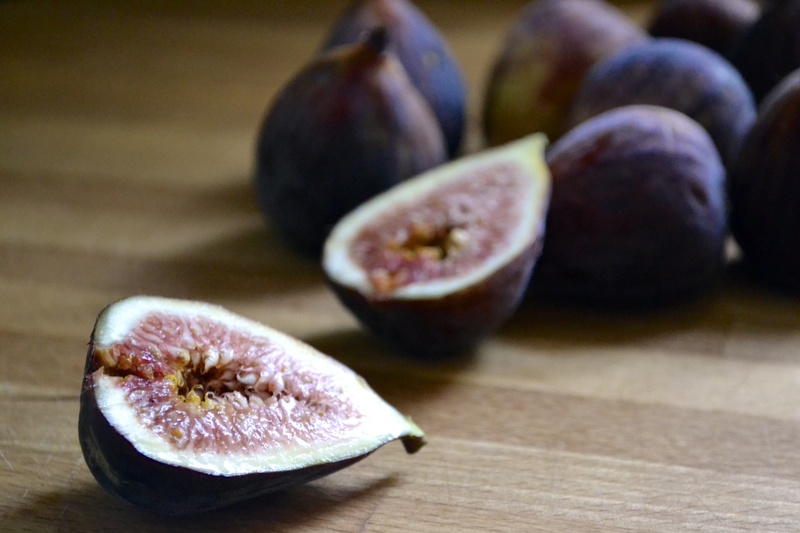 There are numerous varieties with the Black Mission fig being one of the more common varieties found in stores. Each variety differs in color and texture. They are a great source of potassium (helps regulate blood pressure), calcium, and fiber! 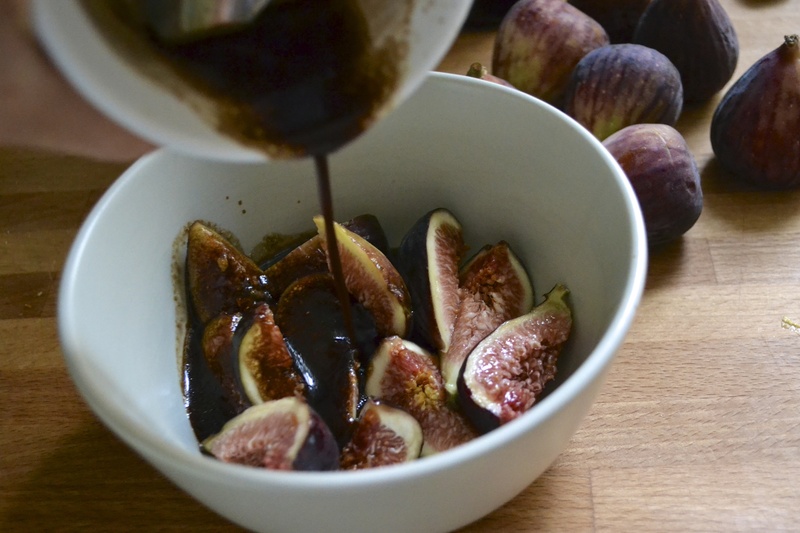 So if you can get your hands on some fresh figs right now…do it. Profess the amazingness of figs. Eat them fresh and feel like royalty. Bake them and feel indulgent! This past week I was lucky enough to get my hungry paws on a FLAT OF FIGS!!!! After gorging myself on plain raw figs, I marinated a few and added them to this amazing spinach salad. 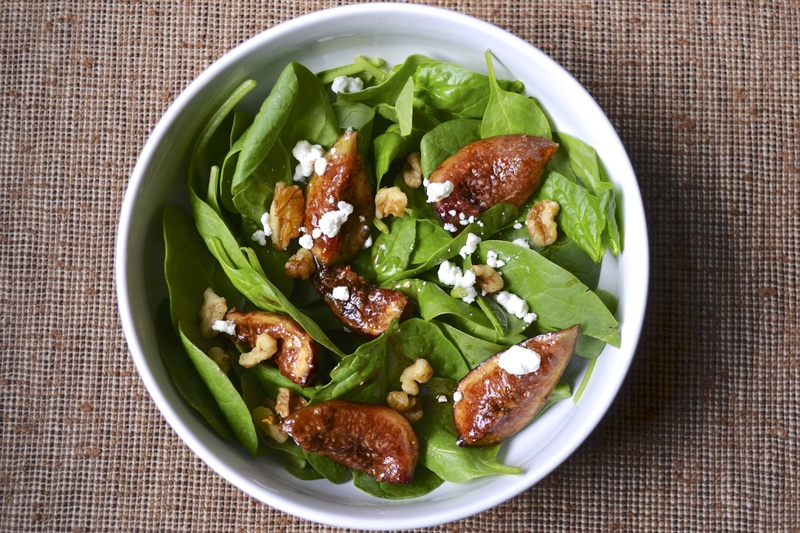 Although I loved the added flavor of the marinated figs, this salad would be fabulous with just the fresh figs and the balsamic-dijon dressing drizzled on top. Ooooh…and a side note, the balsamic-dijon marinade/dressing is prime! I whip up an extra large batch and store it in a ball jam-size jar with a lid and take it to work with me for my lunch salads. Addictive! It’s also good drizzled on sautéed mushrooms and baked chicken. Hope everyone has a great Labor Day weekend!!!! Mix vinegar, dijon mustard, and salt in a small bowl. Add olive oil, whisking constantly. Add figs and stir gently. Allow to marinate for about 10 to 20 minutes while you are preparing other things. Divide spinach between two bowls. Place figs on top of spinach and drizzle with marinade. Top each bowl with 1/2 tablespoon of walnuts and fresh cracked pepper. Sprinkle with crumbled goat cheese, if that’s yo thang. Looks fresh, easy and delicious. 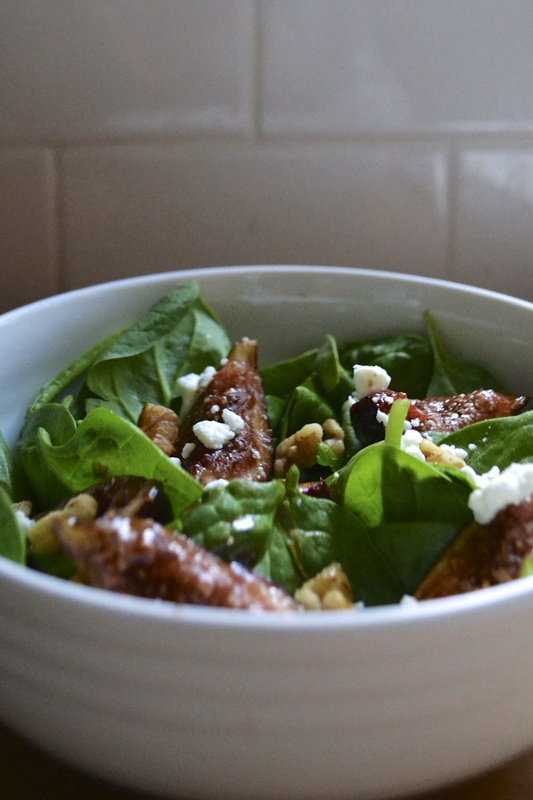 Spinach and figs are the perfect combo. Thanks for sharing.